Did you keep a diary when you were a kid? I did. I love being able to go back in time and find words that express exactly what was going on. Many of my paper journals have been lost or destroyed over the years. I wanted something better for our travel logs. When we started thinking about traveling in an RV back in 2003 – I found Blogger.com and decided to keep my journals there. Tioga and George were my inspiration. A solo, fulltime RVer, George used Blogger and wrote every day – he still does! Because of reading his blog, we met up with George on the road a few times. We credit Blogger with making us many friends over the years. Most everyone we meet who travels wants some way to record and share their travels. Some keep a paper notebook just for themselves, some send an email blast to their list of friends. We think Blogger is the easiest way to keep your journals. It’s free, and it’s certainly simple to share with your friends – just tell them the link. They can even subscribe to your blog via email and get a message in their inbox every time you post. What if you don’t want to share? 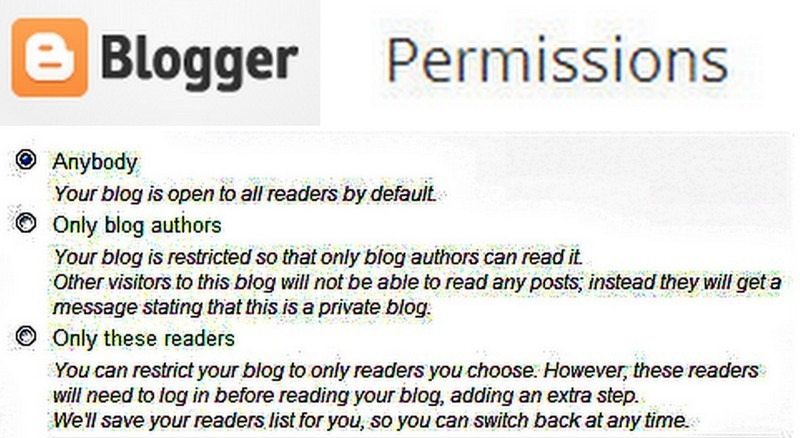 If you just want a private journal – Blogger has settings for that. You can even specify a small group of people that are the only ones with access. You could give each of those people the ability to write in the blog and turn it into a family affair! You could even have one public blog and one private blog just for you. There are lots of web-based blogging systems out there: WordPress, Typepad, SquareSpace, MyTripJournal, and more. We started when Blogger was the only game in town, but we still think it’s the best. First of all it is Drop-dead Easy! Blogger is also owned by Google, so it works well with photos from Picasa Web Albums, and videos from YouTube – which are also owned by Google. Blogger may be the oldest blogging platform on the web, but it’s not old-fashioned! They keep improving all the time. For example, if you use the templates provided by Blogger, then your blog automatically looks different when viewed on a smartphone. The template displays your Blog posts in a way that fits and looks good on that little bitty screen. 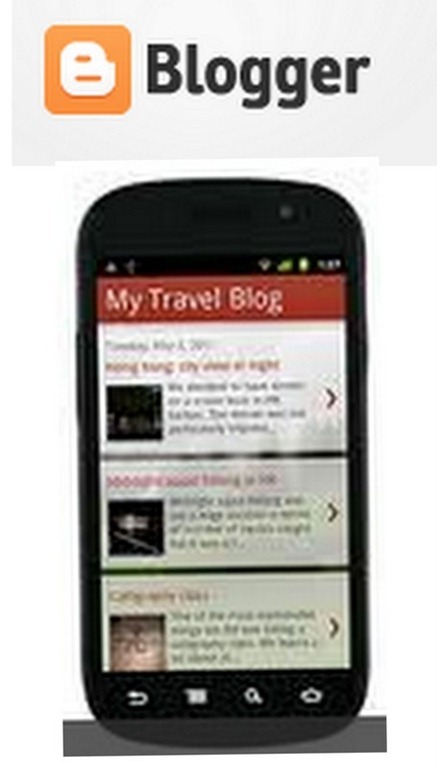 You can even post from your Smartphone with the Blogger app. We started our blog in April of 2003, just before we bought our first RV. Anything that we’ve done since we’ve been RVers is at least mentioned in our Blog. Jim can ask, “What was the name of that park in Washington with the Stonehenge replica up on the hill?” “Just a minute,” I reply, “I’ll look it up in the Blog!” I can just type ‘Stonehenge’ in the search box and come up with this post that talks about the park called Peach Beach. My only regret is that I don’t have a Blog for the rest of my life! I’ve even considered getting out my old paper journals, typing them in and pre-dating them! We enjoyed our blog so much, we started teaching other RVers with a seminar we called, “Every RVer Needs a Blog.” We firmly believe that statement, and many RVers have learned how to make their blog from taking our seminars or watching our Tutorial Videos on Blogger. If you’d like to peruse Blogs by RVers, there’s a site called Hitch Itch that catalogs hundreds of them. You might even meet some new friends if you read a few of these! Over the years, as we’ve added new titles like Facebook and Smartphones to our seminar listings, Blogger started to fade away as something we teach. Lately, we’ve been encouraging groups to schedule this class – and it has been so well received we feel we’re in a Blogger Revival! We taught Blogger to Genealogists this year and they were full of ideas about how blogs could help them in their genealogy research and documentations. We guarantee that, if you watch our videos, you too can have a Blog. Here’s the one that shows you just how easy it is to get started with Blogger. Published by MrsGeek, in Blog. Tagged with Blogger, Email subscription to Blogs, Searching Blogs, Tioga and George of Vagabonders-Supreme. Thought about blogging so many times and then turning it into a book. What are the legal issues and ownership issues of content on any blogging? I tried Blogger a couple of years ago, and became very frustrated with it. Not sure if it has changed, or I have changed, but I am doing much better during this last year using WordPress. I have found very little to complain about. It pretty much does exactly what I ask it to do. I found a simple layout that I really like, so that helps. While I use Blogger for a daily update with a photo or two while traveling, I also use a “built from scratch” website to post larger numbers of photographs, as well as other RV information. It is a bit more difficult to put together, but much more flexible, and pretty much unlimited (my site is at 3.5GB and growing). I use Adobe’s Dreamweaver to build the site & 1&1 as the web host.